In 2015, Alternate Realities (the subject of My Comic Shop DocumentARy) closed after 23 years in operation, setting filmmaker Anthony Desiato on a quest to explore other comic book stores across America. Whether you’re a fan of the Punisher or Plastic Man, you’ll learn something from My Comic Shop Country, which shines a spotlight on the business, culture and community of 20 comic shops in the United States. Comic book characters are box office gold, but why isn’t the same necessarily true for comic stores? See how these shops are turning the tide, one customer at a time, seven days a week. Plus: Learn the fate —and future?—of Alternate Realities. 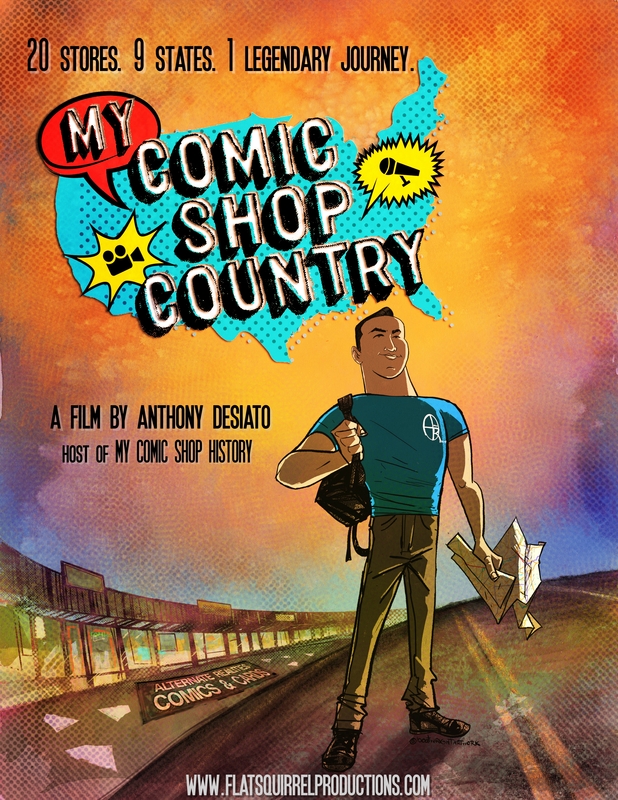 My Comic Shop DocumentARy is an independent, feature-length film about New York’s Alternate Realities. In 1992, Alternate Realities owner Steve Oto embarked upon a journey from lawyer to comic book retailer. It was a journey filled with accomplishment and disappointment, friendship and heartbreak, and a dream that became a nightmare. Humorous, intimate, and heartfelt, My Comic Shop DocumentARy shines a light on the colorful community that assembled at “The Store.” From Oto himself, who dispenses his oddball wisdom in the form of pithy sayings known as “Otoisms,” to a customer who works at restaurant chain T.G.I. Friday’s but claims to moonlight as a member of an elite SWAT team, it’s a community more colorful than the pages of a comic book. A true D.I.Y. project, first-time filmmaker Anthony Desiato handled virtually all aspects of production while attending law school and working at Alternate Realities. The completed film has screened at festivals across the country and garnered press in multiple media outlets, including The New York Times. It is available to rent or buy on Vimeo. Spinning out of the world of My Comic Shop DocumentARy comes director Anthony Desiato’s award-winning follow-up short. Bombastic, cranky, and irreverent, Jay Meisel operated a booth at New York’s Empire State Flea Market for almost four decades. In his cramped and cluttered retail space, the comic book vendor decried a lack of taste and class in modern society, attributed his dwindling revenue to a rising “Latin” population, and berated his customers with a gruffness that belied his kind interior. Jay often said he planned to die in his booth. Instead, when management announced that the flea market was closing its doors for good, Jay faced the far more challenging task of boxing up a life’s work. By Spoon! documents Jay’s final days at his weekend home of 35 years. The film is a two-time winner for Best Documentary (Phoenix Comicon Film Festival, Brightside Tavern Film Festival) and is currently available to rent or buy on Vimeo. The first word Zach Woliner ever spoke was “Ernie,” the name of the orange half of the famous Sesame Street duo Bert and Ernie. Over the next three decades, Zach’s childhood affinity for the Muppets would become a lifelong passion, a hobby, and, if Zach has his way, a career. In 2008, Zach created his own puppet, Wally Wackiman, a Jewish, self-aware character who advocates puppet freedom and equality with humans. Since then, Zach has strived to balance his art with daily life and turn his aspiration into action. Wacky Man: The Rise of a Puppeteer is a feature-length documentary from director Anthony Desiato (My Comic Shop DocumentARy, By Spoon!) following Zach as he pursues a career in the puppetry industry. The film made its World Premiere at YoFi Fest in October 2016 and is currently available to rent or buy on Vimeo.